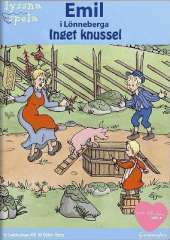 The game is based on the book No Crush, Emil said, when he kissed Prostinnan by Astrid Lindgren and Björn Berg and divided into two parts. In the first part, you help with the preparations for the festival and in the second part Astrid Lindgren reads the story from the book before an interactive slide show. The player can choose to only listen to the story or play small games where they help the family in front of the calf. If the player chooses to help with the calf, make sure that Emil and Ida bathe and for that the player must help Emil to pick up wood that Alfred splits into parts and collect with Anton water from the well. Ida must also help Lina to milk the corn. When the information is completed, the opportunity was offered to help Emil with his snowball war with the teacher. The Kalaset consists of an interactive slide show where Astrid Lindgren reads the story of the feast. During the slideshow, the player clicks on the objects and figures that appear on each frame to make them do something.